I have created nine outdoor environmental installations for the past few years now and with each one, I view them as a gift of gratitude to the natural world. I also view them as away to educate the public about environmental issues. Through the art work I also hope to help people to connect to the nature that is within themselves and around themselves. 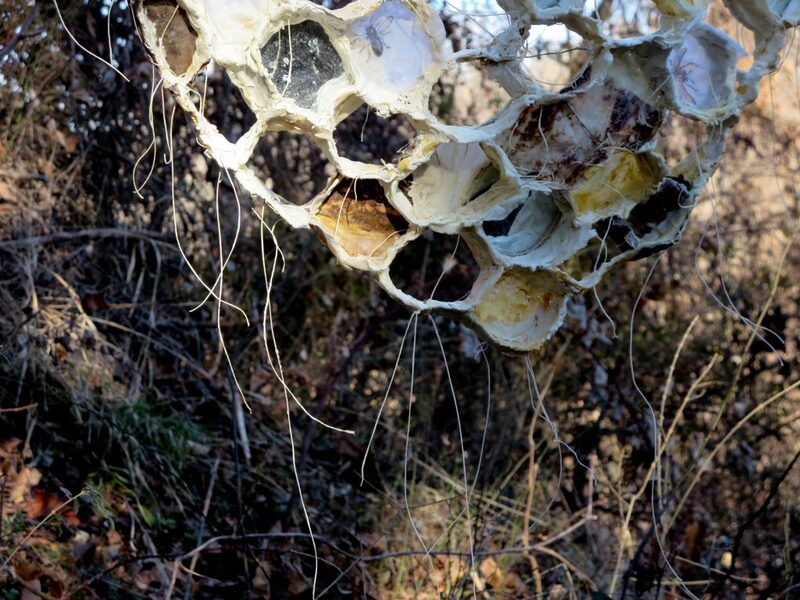 For this particular piece, Keepers of Life, I wanted to address a very concerning issue called Colony Collapse Disorder in which there has been a notable decline in the bee population in the United States as well as world wide. Colony collapse disorder has been a growing concern as without bees, the food supply for humans and wildlife and the planet’s biodiversity would plummet. Scientists are still uncertain whether the disorder is due to pesticides, climate change or both. 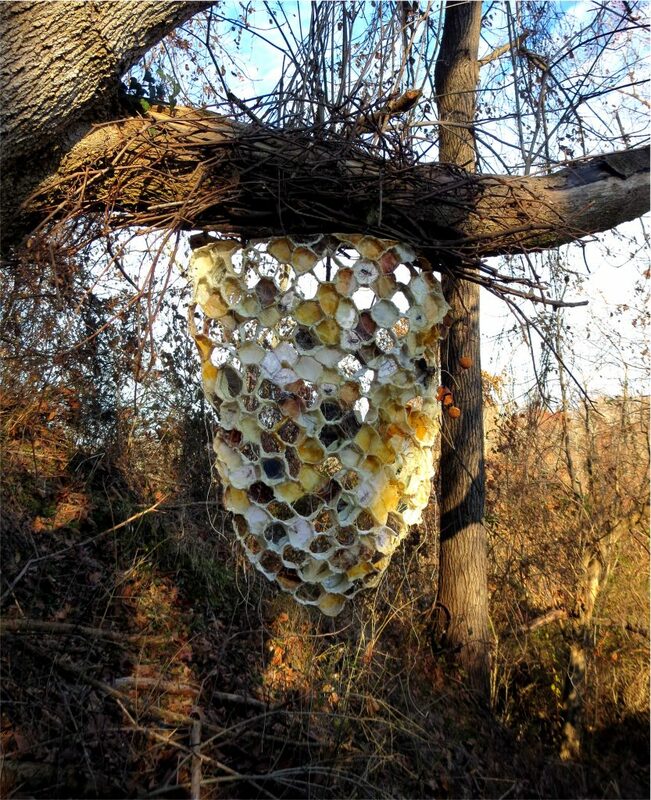 The mirrors in this piece reflect the viewer back to reinforce the human role in both the demise and in the saving of the bees. 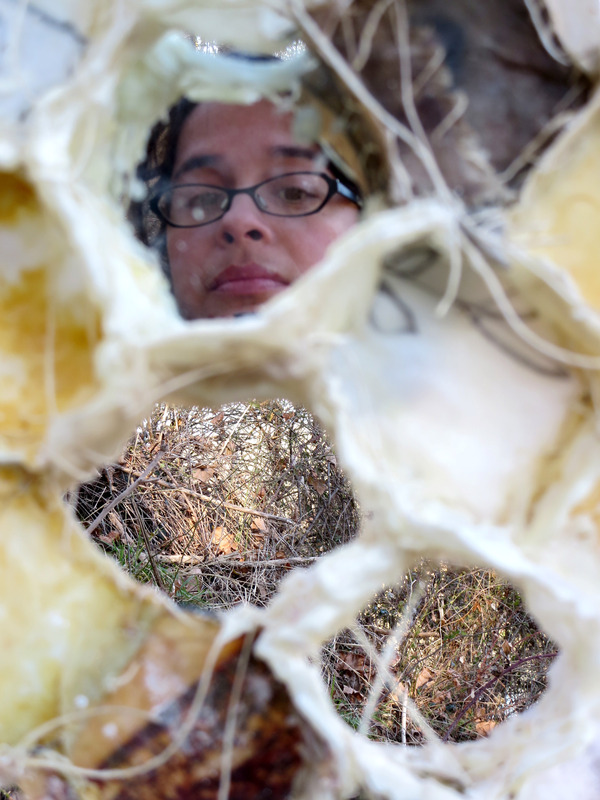 I wanted the passerby to see themselves as part of the hive as well. Humans are part of the problem but also part of the solution. “Keepers” can refer to the bees as the keepers of survival of life on this planet as well as humans who need to act as stewards of the bees. Sadly, a few days after I installed my piece, someone came and tore down my installation and either took it or threw it into the lake. I was upset and disappointed when I found out, of course. When I do these works, there is a process of letting go through out the creating process. 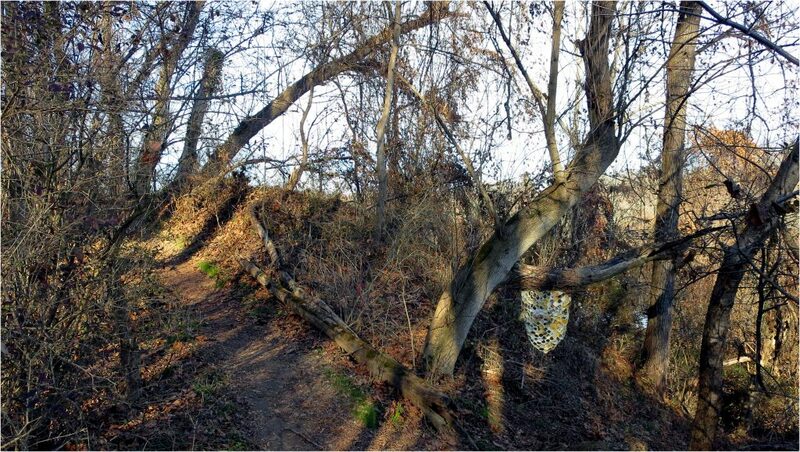 I put these works out on the trail, knowing that there is risk, knowing that the weather, natural elements, decay, animal and human elements will wear on the work. That is part of the process and part of the gift that artists who do this type of work are giving to the world. The hardest part though is accepting the human element in the damage or disappearance in the artwork because it means that someone purposely, with intent, decided to steal, destroy or vandalize. It is disappointing….but perhaps a strong metaphor as to what I was getting at with Keepers of Life- the destruction that human activity can have on the health of the planet and the ecosystem as well as disregard of others. I am more disappointed that the final purpose of my installation- the part of having the public interact with the piece and learn about Colony Collapse Disorder has been taken away. 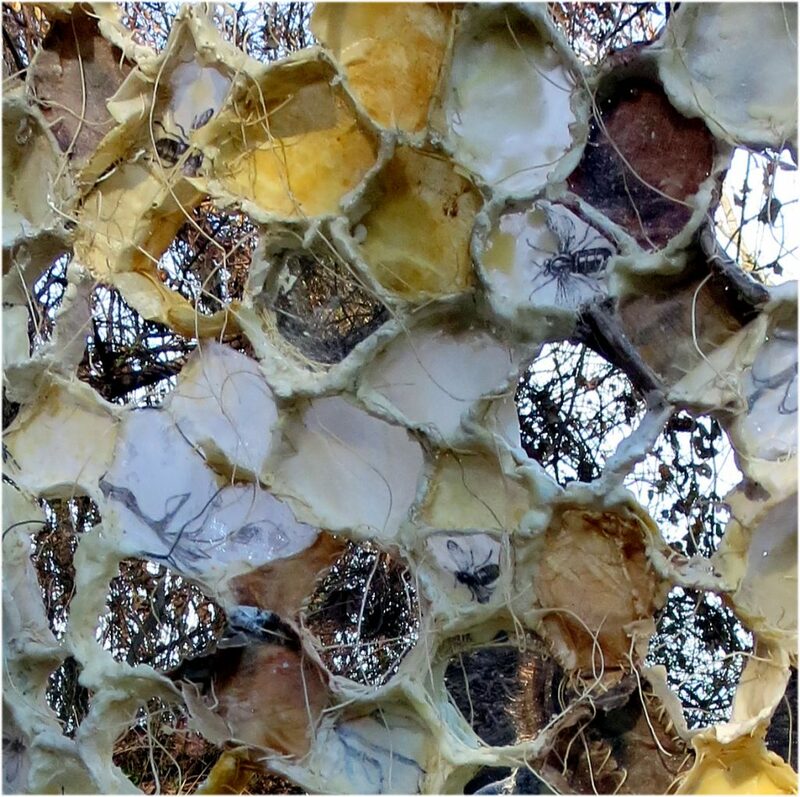 Ephemeral work is temporary and the meaning of the work lies in the process of the artist collaborating with nature. It is a joy for me to work with and in nature and no one can take that aspect away. My work often has threads sewn into or woven in and out of the piece whether it is 2D paintings or these types of installations or book art. These threads serve as a metaphor that we are all connected. Some outside force may come in and try to sever those connections, but in truth, they cannot be severed. 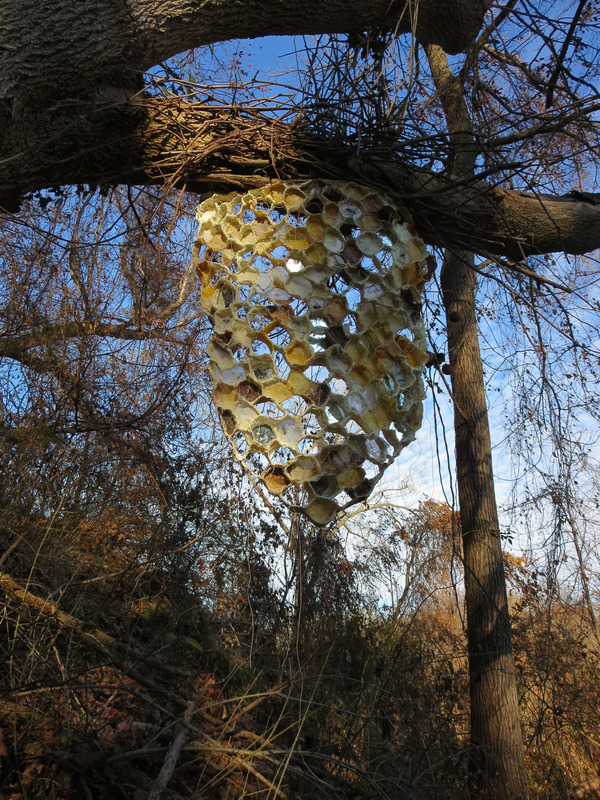 A week after my hive was taken, another act of destruction occurred and my other fiber piece “Social Network” that I installed in 2016 was cut down. Fortunately it was found thrown in the lake and a kind person waded out into the cold water and fetched it. In truth, I am still reeling from the purposeful damage done to my artwork that I truly see as a gift to the public that use the trails. This is my heart’s work and it’s been difficult for me to release the disappointment and disillusionment these past two weeks. But as I wrote above, I let go of the work to whatever may happen to them. I had a good long quiet moment with “Keepers of Life” after I installed it, expressed my gratitude to it for the lessons it taught me and said goodbye before I walked away. As my good friend Jen said to me after she learned of what happened to my hive piece, “Be like a bee and build it again”. The bees are persistent and always dedicated to the health and well being of the hive and they build and build and build again. To view all my outdoor art installation in one place, please visit this album on Flickr. Because “Social Network” was found I am still holding out hope that “Keepers of Life” will also resurface. Thanks Shannon for your encouragement! When i met you I remember telling you that I felt such a strong pull towards this type of work even though at that point i didn't even really know what I meant. Your encouraging words mean so much to me. Thank you always. It seems that we all always have to put up with stupid somehow or other!